I use MobileNoter app on my iPad and Microsoft OneNote on my PC when taking notes. Fortunately, I can sync MobileNoter notes with my OneNote notes using MobileNoter sync program which has additional cost. I bought Wi-Fi sync license so I can sync the two software via wireless network. To sync from the Cloud, you'll need a different license. Now with the release of MS Notes on iPad, I can use OneNote to take notes both in my PC and iPad. 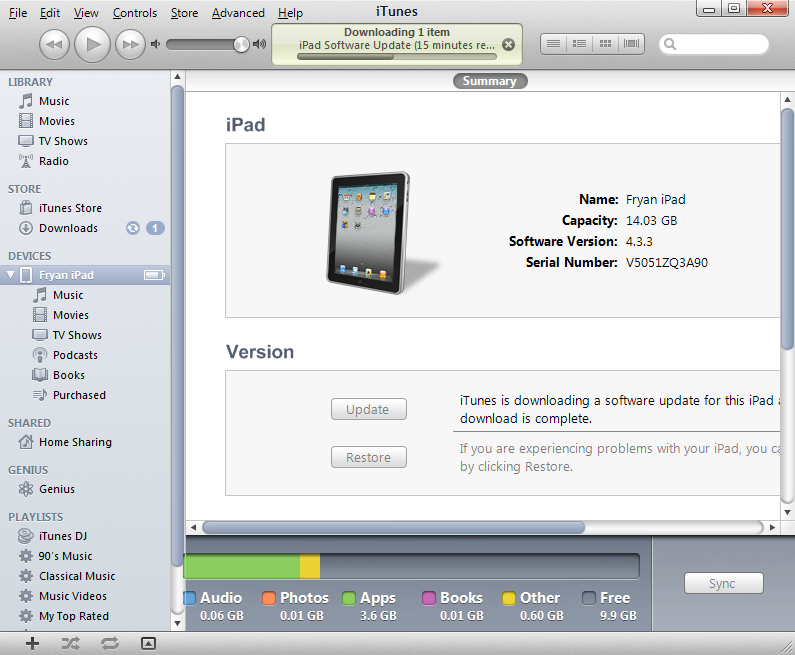 The iPad version has a great looking interface. It provides you two-pane interface -one main pane on the right for your notes and a sidebar on the left for navigating your notebooks and pages. If your like me who uses Google Mail Address book for managing contacts in the cloud then probably your also in the hunt of app that can sync Google Mail Address Book with Microsoft Outlook. Fortunately there are plenty apps for this and one of them is GO Contact Sync Mod. 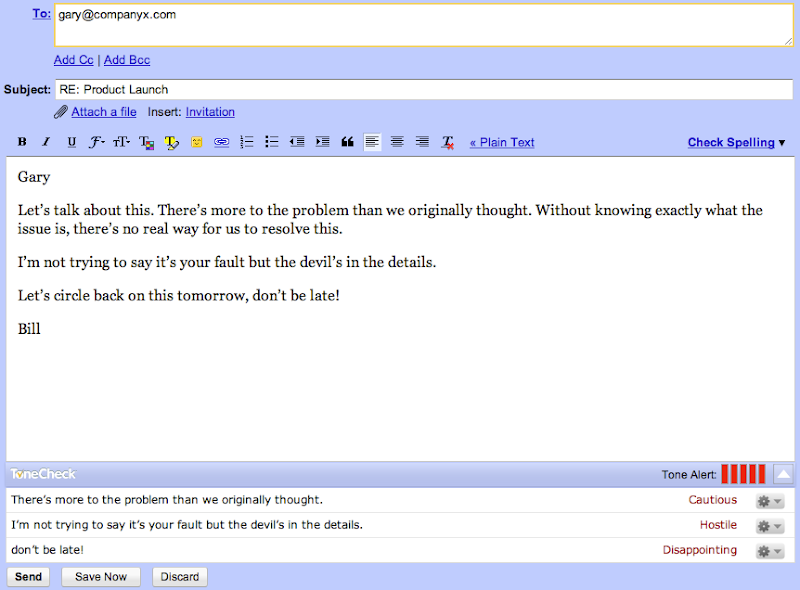 It is an opensource program that synchronizes your Microsoft Outlook contacts with your Google Mail address book, including pictures, categories and notes. To sync your contacts, enter your Google account info, enter a profile name, select a synchronization format (Sync Deletion, Sync Contacts and Sync Notes) and choose synchronization criteria (e.g., Outlook to Google synchronization only, Google to Outlook only, etc). Once your done with program settings, Click Sync to synchronize your contacts. For Windows administrators, Remote Desktop Connection is one the most valuable tool for their day to day tasks. 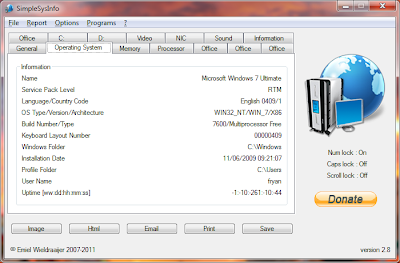 It is a built-in tool in later Windows version that enable access to remote computers. Typically when sharing local drives for the remote computer to access, we use Windows sharing method. But such method would open the shared drive to other users in the same network as well. A better method is to forward these drives to be shared from the Remote Desktop Connection tool itself. To do that, just click the Options on the tool's main form. 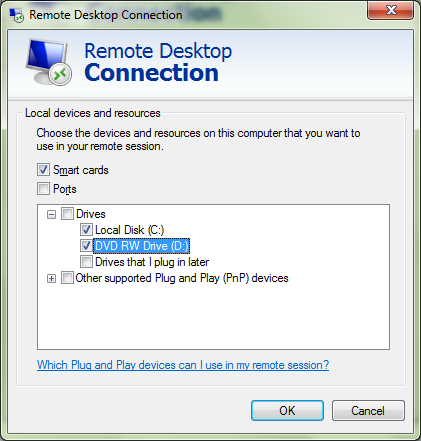 This will expand the Remote Desktop Connection tool. Next step is to click the Local Resources tab and then click More button. From the popup dialog, expand Drives from the available list and then tick each drive you would like to be shared as shown below. Are you banging your head in your computer because you accidentally deleted the only copy of your presentation? You don't have to that because you can still recover it. The first thing you have to remember when you deleted a file is do nothing and stop using your computer for any operation until your done recovering your deleted files. Using your computer for anything aside from recovery tool will only worsen the situation because another data may be written over your deleted data. One easy recovery tool is Kickass Undelete. It is a portable and opensource software for Windows that can easily retrieve recoverable files. Its usages is simple, select the drive which contains the deleted files from the left pane, and click Scan button to start scanning for deleted files. 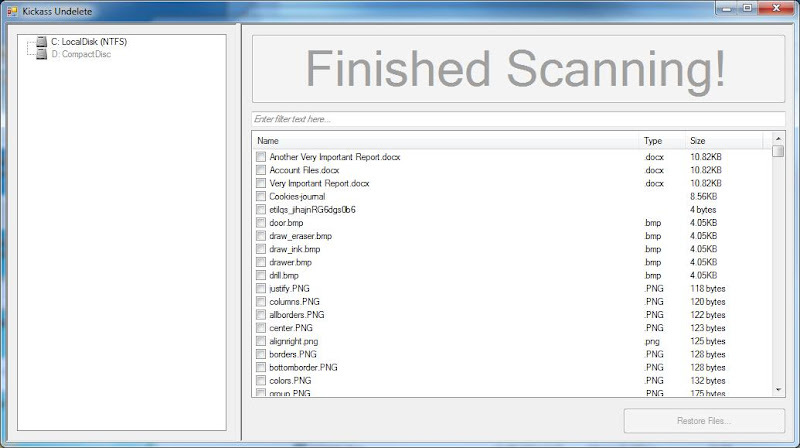 Once the scanning is complete, you can check any scanned files from the result list and click Restore Files button to start the restoration. To transfer files from one computer to another on a network when the computers are under the same operating system is a piece of cake. But doing it on different platforms is a bit challenging. To help you easily solve such obstacle, you can use Transfer-On-Lan. It is a file transfer tool that can run on any OS as long as java is installed. 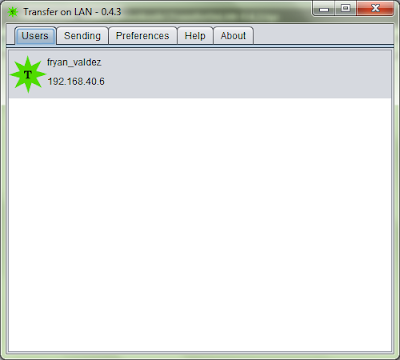 To use it, you need to install Transfer On LAN on all the machines that require sharing files. When running the app for the first time, head over to Preferences tab to specify User name, Destination, Avatar image and Sound. From the Users tab, you'll see all the computers that you have installed Transfer-On-Lan. Right click one of them and click Send to start transferring files. The other computer will get prompt to accept the transfer. Click Yes to begin transferring folders/files. When you are are using a single PST file to archive all your emails, eventually it will get bigger and bigger everyday. This maybe not a good strategy to store all your archive emails since maintaining a very large will be painful if the size go overboard. Fortunately you can split this large file by year or size with MailScavator. 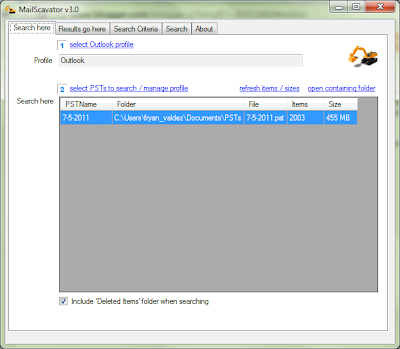 With this tool, you can convert any PST archive into multiple files sorted according to year. 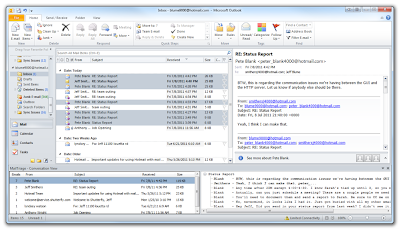 Once installed, first step is to select the outlook profile to scan. Second step is select the PST files to search. One of the reason why Android OS is so popular is the fact that it has a lot more free apps to offer over other mobile operating system. Almost any app you can think of can be downloaded from Android Market. If you have a favorite Android app that you wish you can play in a larger screen like your Windows desktop, then Bluestacks is the answer. BlueStacks is an Android app player for Windows that allows you to run any type of Android app in full screen mode without any performance or compatibility issues. Once you installed it on your Windows PC, you'll be able to run and play your favorites games such as Angry Birds and Plant vs Zombies. After installation, you will see a gadget on the top-right corner of your screen. Clicking the gadget will show you the App Tray. Select any app and it will automatically run it in full screen mode. Watch the cool video showcase after the jump. Although I'm not really an Apple die hard fan, I admit that the sudden death of Steve Jobs the co-founder and a long time respected leader of Apple struck me. His vision who drives Apple to where the company stands now is greatly appreciated by million of peoples including Apple and non-Apple users. To honor a genius who contributed a lot in reinventing Technology that we are enjoying now, I dedicate this post to him. Thank you Steve. You can visit Apple.com to share your thoughts or condolences. Are you always forgetting your USB stick at office or at home? Prevent such from happening again by allowing your computer to remind you whenever you initiate shutdown. With USB Guard installed, you'll have free monitoring tool that checks your computer for connected USB devices during shutdown process. It interrupts the shutdown and you'll be prompted with a warning message. You can either choose to ignore the message (this will prevent the shutdown) or proceed to shutdown, standby or hibernate the system. Saving your documents in the cloud gives you flexibility to access these files virtually anywhere in case you need them. Google Docs is one of the top competition on free cloud service game arena and its integration with other Google apps makes it more appealing to cloud users. But of course there are still room for improvement. 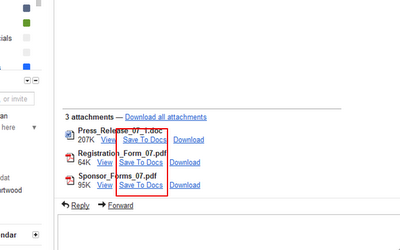 When you receive an attachment on your GMail account, you have the option to download it or view it via Google Docs. Can you see what's missing? Yes it would be better if you also save it to your Google Docs. 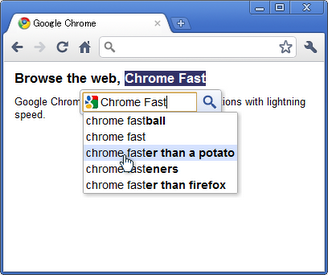 Fortunately for Chrome users, there is an extension for that. Gmail Attachments To Docs extension allows you to save GMail attachments directly to Google Docs. Once installed, you'll have a newly added Save To Docs link beside each attachment. When you click this option, the file will automatically save to Google Docs. A new tab page will open to notify you that your file has been saved to Google Docs. 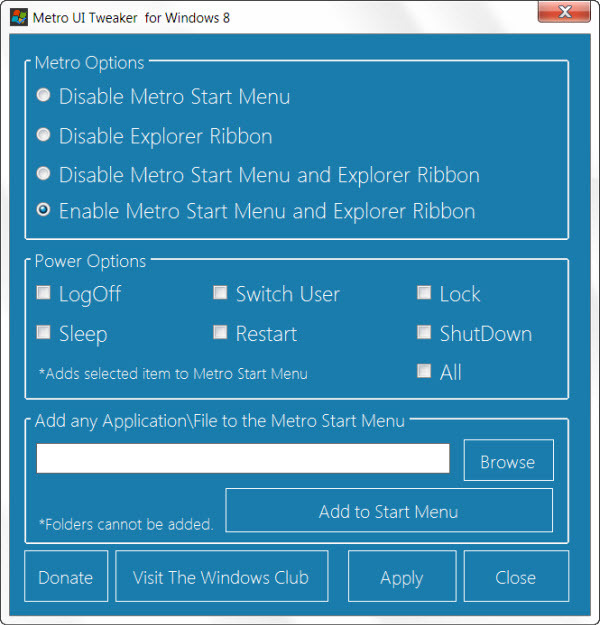 Metro UI is now the thing in Windows 8. It replaces Windows 7 classic start menu. Personally I like the new Metro UI but for some it maybe too soon to adjust to the new interface. 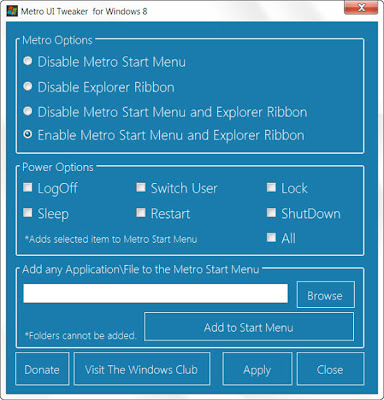 If your one of few (maybe) who still wants the old start menu then you can bring it back with Metro UI Tweaker for Windows 8. It is a free utility that allows you to tweak few settings that are not natively available to Windows user. 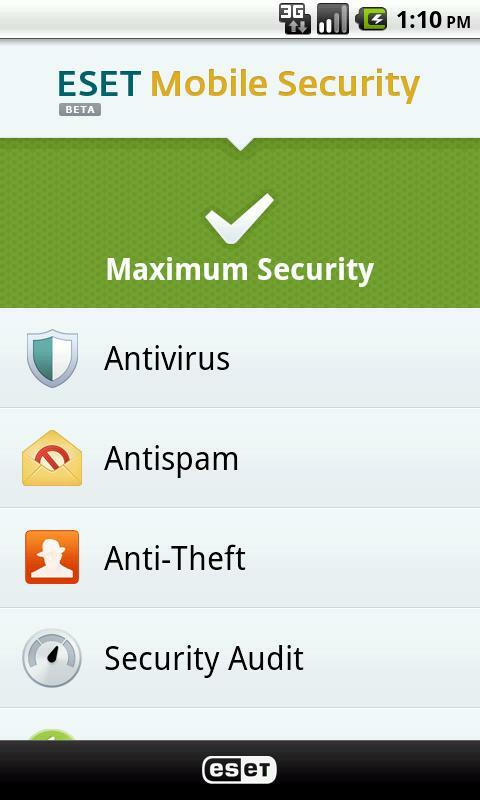 To apply tweaks, just run the EXE of this portable app, select the desired options and click Apply. Simple as that. You need to restart Windows to for the changes to take effect. As a tablet user, I am familiar with PIN code protection. I've seen and use it in mobile devices such as iphone, ipad, ipod and other apple devices. With iOS, you can even use PIN to protect each application if it supports PIN code security. If your prefer PIN code over username and password in Windows desktop then Windows 8 has good news for you. You may now replace the conventional account password protection in Windows with PIN code protection. Although this option has been added to Windows 8 for tablet users, you can enabled it also in your desktop computer. To get started, go to Control Panel from Windows 8 Start Menu.Select Users from main navigation bar and click Create a PIN button. Can wait until the official arrival of Windows 8 in the software market? here is how you can get hands with Windows 8 today. Head to Windows Dev Center where you can download the developer preview version of Windows 8. The Windows Developer Preview is a pre-beta version of Windows 8 for developers. Take note that this release is not yet stable and may contains a lot of bugs so don't use it on your production machine. Features and functionality in the prerelease software may not appear in the final version. You can click the link to dev center after the cut. Efficient people can do multitasking with ease. Professionals such as IT personnel who needs to multitask daily are most often have several computers on their desk to perform different types of jobs. If your one of them then probably you also have different sets of mouse and keyboard for each computer as well. With software download from The Garage, you can use a single mouse to manage all computers you have. Mouse Without Borders is a software that allows you to reach across your PC's as if they were part of one single desktop. 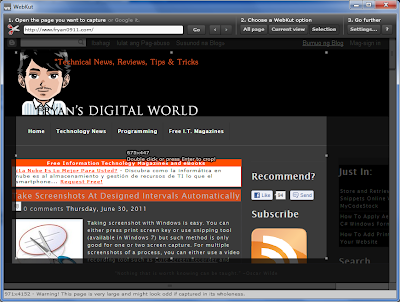 One notable feature is the ability to drag and drop files from one computer to the other. Just select the files on one computer and drag and drop them to another to copy or move them to the second PC. You need to install this software on all computers that you want to control. Here is a video demonstration of this cool software after the cut. Finally I was convinced to use Apple iPad over Android devices and so far I'm glad that I have tried it. One thing I did right away is to try to change the device name of my iPad but come to my surprise, you can't rename the device name from the iPad device itself. I know this is already an old topic but new discovery to me is worth sharing. To rename your iPad's device name, you need iTunes software on your computer. Just connect your device using its cable to your computer and open iTunes. On the iTunes left pane, find your device from the Devices section. Double click it and enter the new name. Click the Sync button from the right bottom of the screen to apply changes in your device. Walla! simple as that. It is very seldom to know someone that still don't have a mobile device nowadays. Most of the time, everyone wants to be connected and Wi-Fi is the most convenient to hook your mobile device to the internet. And because your here and reading this article, I bet that you have your own Wi-Fi connection setup at home or at the office which probably has a problem right now. To help you solve your Wi-Fi problem, here is an easy to follow flowchart diagram by 7Tutorials that walks you through steps to troubleshoot wireless networking problems. The charts cover every basic problem to more complex one. Grab your copy now. You can print it or share it to your friend that needs help. If you prefer reading eBook over a real book but don't want to miss out the excitement of flipping pages then you can try converting your PDF to HTML Flash with Codebox. If you don't want another conversion tool, then read it as is with Flipping PDF Reader. It is an alternative to Adobe Reader with the nice flipping book effect like in a real book. It provides option to switch to a two page view, view recently accessed files in a book shelf, a thumbnail view of the table of contents, a customizable interface and scroll through pages or zoom in/out using the mouse pointer. A TV commercial caught my attention last night. It was about a kid who received a SMS message from a friend telling him that he was tagged on scandalous photos that were taken during a party where he got drunk. He immediately jump out of his bed to go to the nearest internet cafe to untag himself from the photos. Unfortunately for him, it was already too late in the evening which why the cafe is already closed. No one would like to be in this situation thats why Facebook constantly improving their privacy features. Just yesterday Facebook announces the release of Profile Tag Review which empowers users to approve or reject any photo or post they are tagged in before it's visible to anyone else on their profile. If you don't want to install Google Talk desktop client in your PC at the same time not comfortable with Google talking within your GMail account then you have another option. With Gtalklet, you'll stay on chat even you switch from tab to another. 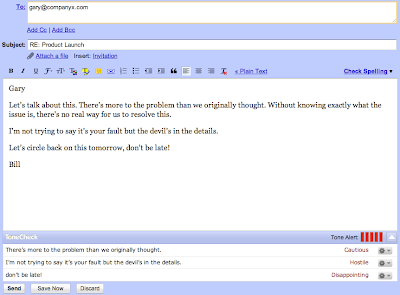 Gtalklet is a Chrome extension that add a small gtalk client inside Google Chrome. The Gtalk client is always on top even you switch tabs. I mentioned on my last blog post my frustrations toward the new messenger UI of Facebook. I suggested on that post that you should use a desktop messenger instead. But if you prefer on staying on your browser but would like to eliminate the chat bar and offline users then install Facebook Chat Bully extension for Firefox and Chrome. Once installed, you have to enable the extension's options by going to your browser's extension page. For Chrome, there are three options: hide offline users, hide idle users and hide user avatars. The new Facebook chat interface irritates me. I don't know what they are thinking to design the chat UI that way. The previous interface was OK and you can customize to see friends that are online. On the new UI, you can see everything even offline friends and to find friends that doesn't appear on the list, you'll have to type the name on the search box available. Fortunately, I don't have to bear with this changes made by Facebook because I can use a desktop chat client called fTalk. This application allows you to chat with your Facebook friends on a clean and minimalist interface. 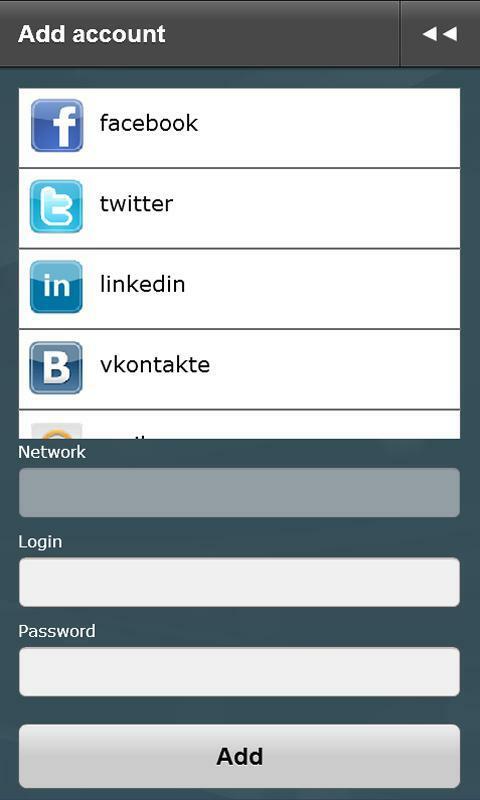 Once installed, launch fTalk and login with your Facebook account details. You will be redirected to the authorization page via your default browser. 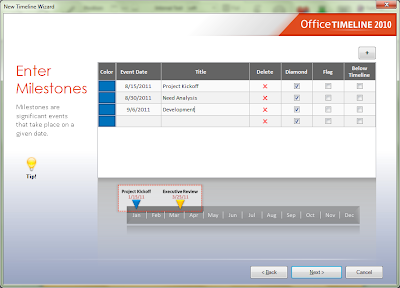 MS PowerPoint is the most appropriate tool to use when presenting highlights and overview of an event or project. For example, in software development projects, my choice of tool to create a project schedule plan is MS Project but whenever I present it to top management of the company, I use PowerPoint. Usually I manually draw the timeline in PowerPoint using shapes and arrows. 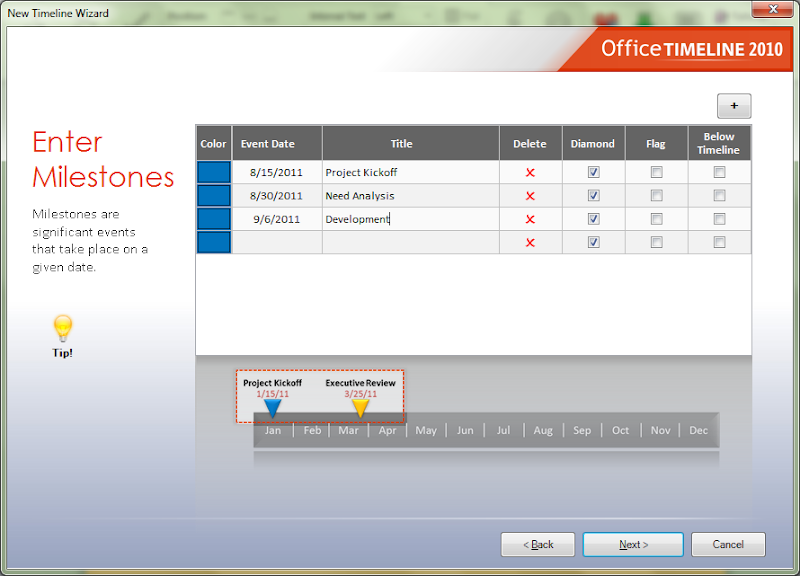 An easier and better way to do this is to download and install Office Timeline add-in. Once you installed the add-in, it will start a wizard which will guide you through the process of project timelines creation. It is a good practice to lock your windows screen before leaving your computer to avoid misuse of your computer while your away. But most of us forget this basic things which may compromise our computer security and as well as our own privacy. To help you on this situation is Screen Locker. It is a portable application that allows you to schedule the locking of your Windows screen. When you launch Lock Screen, you will be prompted for the time duration "To Pause" before the app locks your computer and the "Pause" time in minutes on which it will allow you to logged in again. Click Save to commit the changes or click Lock to quickly lock the system. When you are not emotionally well (angry or frustrated), it is suggested to avoid composing correspondence to prevent reflecting your emotions in your choice of words. You should maintain your professionalism by avoiding too emotional words or phrases in your emails. To help you avoid such situation, you can use Chrome's ToneCheck extension for GMail. This extension that adds tone checking in your GMail accounts. Once installed, as you compose your message, ToneCheck will automatically detect the tone in your message, and will alert you for any potential "tone" problems. It adds a small indicator just below the email body that has small vertical bars that turns red if your tone is questionable. Couple of months ago, I mentioned about FbSym, a web app that allows you to add symbols to your Facebook status updates. A similar tool for Twitter is here, it is called Twitter Symbols. It is a web app that lets you enter symbols and characters by tweeting from it. It makes your tweet more fun and interesting. To use it, you'll have to connect the website to your Twitter account. Once connected, enter your tweet, add symbol/s by choosing any of the available symbols below the tweet box. Lastly, click send to post the tweet. 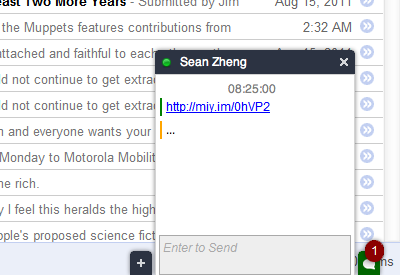 One notable feature of GMail is the conversation threading which group emails into conversations for easier reading. If you want to port similar feature to your Outlook 2010 then you just have to install MailTriage add-in. 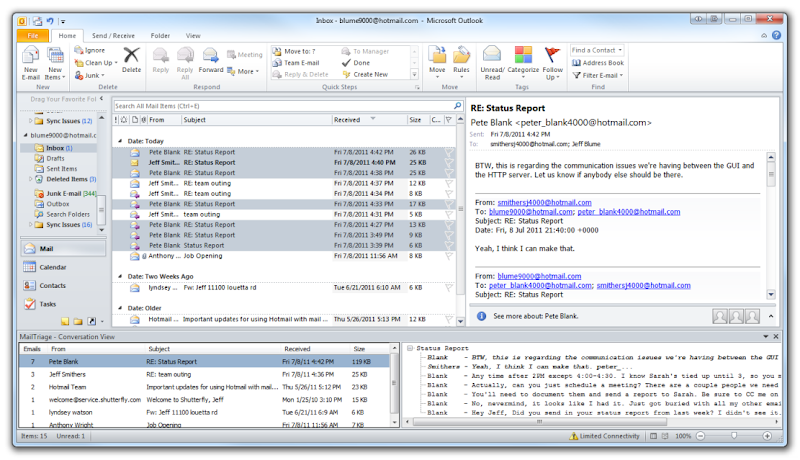 It is a free Outlook 2010 Add-In that groups emails into conversation and display them in a separate window pane. This is very useful for users who get hundreds of emails everyday. Once installed and launched for the first time, it categorizes all the emails from selected account into easily manageable conversation groups. The add-in will add two panes at the bottom of the window. Conversations groups are displayed in left side of the pane whereas the right-side shows the content of the selected conversation. Social networking sites, for some is already a necessity that they can't live without. Many application for mobile devices were released to access these social networking sites while they are on the move. For Android devices, one notable app that you should have if you don't want to use more than one app for each social networking account is QISS. It is a unified IM client to cater all your social networking chats. You can post photos, news, links on one of your favorite social networks, on several networks or on all networks at once. To hold multiple user accounts together from various social networking sites, you should register for a free account which you can do so from within the mobile app. If your using Google Calendar to track down your schedule and needs to automatically add Facebook events into it then you'll need one extension for it. "Add Facebook Events to Google Calendar" extension allows you to quickly add any Facebook event to your Google Calendar account by clicking a link. Once your done installing the extension, you will see the added link "Add to Calendar" at the top of the screen just below the title. Clicking this link will automatically take you into the event creation screen on Google Calendar. Major browsers provides several ways to instantly search keywords in major search engines. For example with Chrome, you can search by either directly typing the keyword on the omnibox or by highlighting any keyword within the web page then right click and select search from the context menu. Another additional and cooler way of searching is by using a Chrome extension called Highlight To Search. Once this extension is installed, whenever you highlight keywords within a web page, a magnifying-glass icon will appear below the highlighted keywords. When you click on the icon or the keywords itself, a search box that is autocomplete capable appears for you to search quickly and easily. 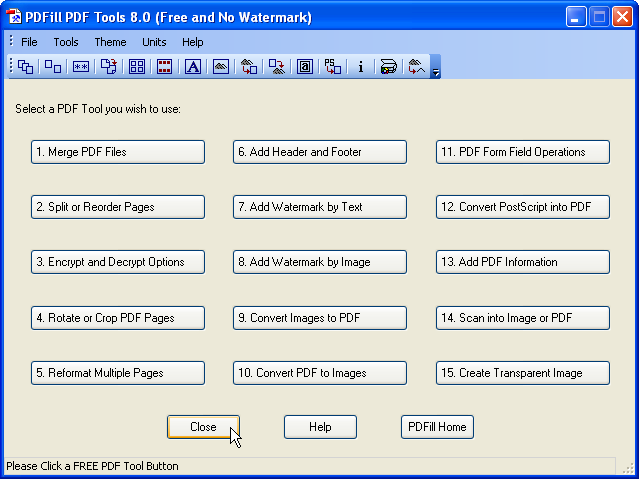 There are abundant document converter out there that promises conversion to pdf, html and etc. Having various conversion tool for different format is plainly impractical. To have all these conversion formats in one tool, install Hamster eBook Converter. It is a free converter that can convert ebooks in different formats for different devices (Amazon, Sony, Asus, iPod, iPad, iPhone, PSP, Blackberry, Zune, iRiver, etc.). Watch this video of Hamster eBook Converter that demonstrate how the tool works. Having your own personal computer or personal disk for your personal files are not an assurance of privacy. When you lost these devices, someone could get hold with your personal files and use them. To avoid such situation, you can encrypt these files so no one but you can open them. One of the most popular tool for encryption is TrueCrypt. To learn how you can use it, MakeUseOf has released an ebook "Lockdown: Secure Your Files with TrueCrypt". After a long stressful day at the office, your bed is most likely your favorite destination. From sleeping you can regain your strength and free yourself from stress, but what if you can't sleep after lying in your bed for hours? 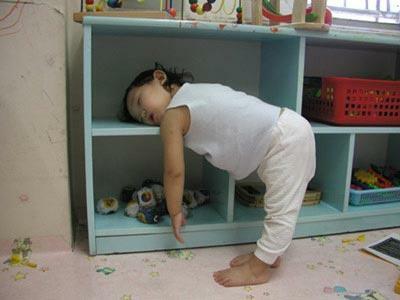 According to Stimulus Control Therapy, it takes practice to fall asleep in bed fast. With these 6 easy steps, you should improve your sleep. Doing something at the office that are not related to work can get you reprimanded or worst fired. If you just can't help it, there are plenty panic button and boss key software here that I had posted before. Another software that has the same functionality is Simple Window Hiding. It allows you to hide any windows in your desktop by holding down CTRL and ALT keys and click on the window that you wanted to hide. To bring back the hidden window anytime, right-click on the system tray icon and select the minimized window's name. 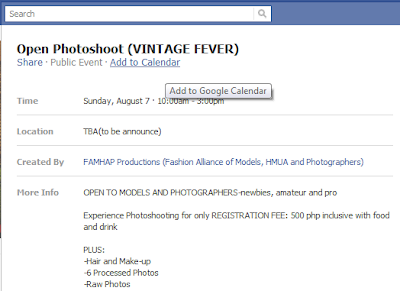 Almost everybody already have a Facebook account, that is why it is also widely used to organize events. 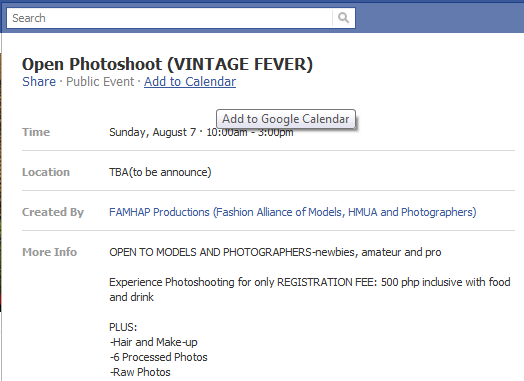 Instead of sending old fashion mail invitation, we do it now in Facebook by creating an event. From the event invitation, guests can confirm or decline their attendance and at the end of the day, organizer will have an almost final list of attendees. One feature that Facebook event lacks is the ability to download the guest list and this is what evuli can provide. To download your guest list, you have to follow 3 easy steps. 1. From evuli website, connect to your Facebook account. While waiting for the arrival of Windows 8, you can start experiencing Windows 8 without actually installing it by converting your Windows 7 by adding free add-ons like the Windows 8 Desktop Clock. 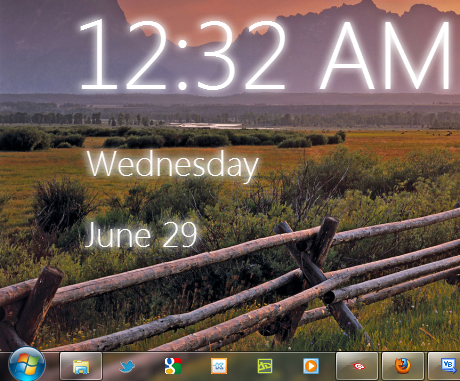 This freeware let you show a Windows 8 login screen look alike clock in your desktop. Just download this app and launch it to automatically add time and date to your desktop as shown below. Not all Windows apps are created the same. And one the evidence of such claim is the lack of option to display Windows app always on top. There are situation that you need this feature, for example when you are monitoring a process window or your watching a live video feed while doing something else. To forcibly add "Always on top" feature to any windows, you can use Window On Top app. A free app that was specially designed to do just one thing, to make specific window to be topmost. 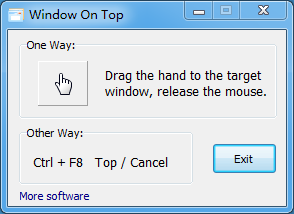 Its usage is very simple, just launch the app, drag the hand icon into the target window and release the left mouse click. The much awaited Windows 8 may arrive sooner or later than everybody expected. If you can't wait, then temporarily quench your thirst by using Windows 8 Ultimate Tile Themepack to make your desktop look like Windows 8. Once downloaded, extract the themepack on your computer. It comes with red, blue, green and yellow versions. Each color has one for 16:9 displays (1920x1080) and one for 16:10 displays (1728x1080). There is also a black color theme which is designed for 16:9 displays. With built-in snipping tool of Windows, you can capture screenshot of web pages but your limited to the part that is viewable. For example, once you press the new button of the snipping tool, you can only take screenshot of the part that can be seen. With WebKut, clipping web pages is easier and flexible. WebKut is an AIR application that allows you to capture part or a whole web page. You are given 3 capture options: the entire page, the current view, or only a selection. To start capturing with WebKut, enter the web address of the web page you want to capture. Choose your desired capture option, configure the settings to be used such as file types, image ratio & quality, and change output directory. Facebook updates scheduling? funny hah? it may not be applicable for ordinary Facebook users but it would be helpful for people who regularly post updates regarding their products, website or company. Postcron is a web service for this kind of situation. To schedule a post, visit Postcron website and click Login to allow Postcron app in your Facebook account. Once your logged-in, enter the text, link or photo you would like to schedule to be posted and click Schedule button. A box will prompt to ask for the date and time when the post should be added to your wall. Internet browsing is one of the most common source of security breaches so most of companies strictly implement secured web surfing at work. Social networking sites such as Facebook and Twitter are usually blocked from the company's firewall. Some do not block it in their firewall but the responsibility to control browsing is with the bosses of each department. If your lucky enough that your situation is the latter, then you may discretely use Facebook by disguising it as Excel sheet with the use of ExcelBook. You can login to your Facebook account and get all important updates, while appearing to work on a regular excel job. You can start by logging in to your Facebook account from the File menu and authorize access to Excelbook application from your Facebook account. Certain restrictions in Facebook and Twitter prevents user to search old posts. For example, With Twitter, you cannot search for tweets that are already more than two weeks old. Fortunately, SocialSearching can be the back door to search for old posts. SocialSearching is a web tool that allows you to search beyond the restrictions of Facebook and Twitter. From the website, you can start by choosing between the two social networking sites. You must login using your account and from there you can go back in time to fetch updates from old posts. Clicking on any of the results takes you to the actual tweet or update. Not so long ago, to know the relationship status of a person, you either have to ask him or her or ask her friends/relatives about it. With Facebook, you don't have to anymore, because three out of every five Facebook users show their relationship statuses on their profile. Here is an infographic showing statistics and facts on how Facebook affects relationships. Installing a fresh copy of Windows 7 requires online activation. Microsoft made use of online activation to prevent or minimize software piracy. They also imposes a certain number of limit in activating license. If you re-install OS often, there may be time that you would reach that limit. The only way to activate your windows by then is either by calling Microsoft support or purchase a new activation key. You can avoid such hassle by using 7Tokens Manager. It is a free tool that allows you to backup Windows key, certificates and tokens, and restore it later to activate Windows offline. 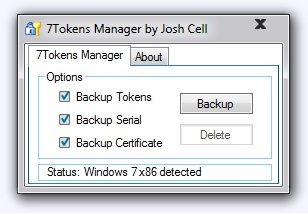 It is very simple to use, just click the Backup button and all these activation info are copied to the backup directory residing in 7Token Manager. Last year, Facebook introduced facial recognition where it can suggest to your friends photos that look like you. You friends can either accept the suggested tags or not. 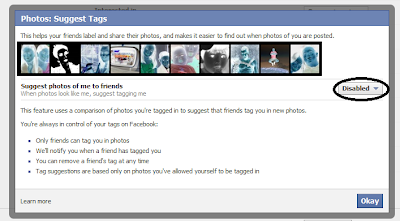 This feature is enabled by default, if you don't want Facebook suggesting you to your friends for tagging then you can disable it by following these steps. 1. Go to Account > Privacy Settings. Click on Customize Settings. 2. Under Things other share, look for "Suggest photos of me to friends" then click Edit Settings button. 3. From the popup dialog, choose Disabled from the dropdown list and click Okay. There you go. 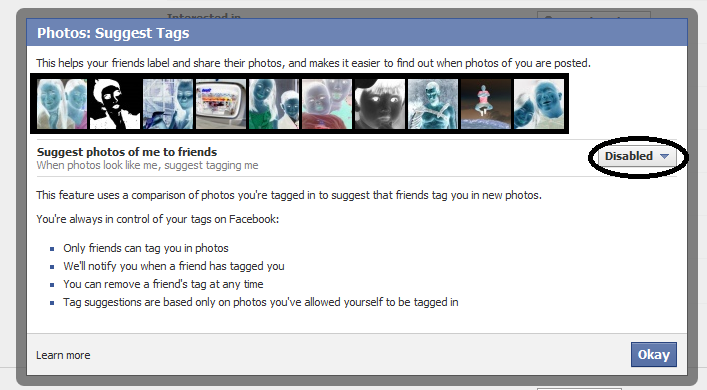 Facebook won't suggest to your friends tagging photos that looks like you. When your a multi-task computer user, you often have several opened applications on your desktop. This could mean several application icons in your Task manager which sometimes don't all fit and Windows auto hide them. To make your taskbar wider or larger, you can set your Windows Taskbar to use small icons instead of the default icons. Follow this step-by-step procedure to make use of small icons. 1. Right click the Taskbar and click Properties from the context menu. 2. Under Taskbar tab, tick the "Use small icons" checkbox. Alternatively, you can also change the Taskbar buttons behavior. For example, you can set it to "Always combine, hide labels". Although LCD manufacturers have high standard policy in dead pixels, there are cases that you may find dead pixels even with brand new LCD. If you suspect that you have dead pixel on your LCD, you can test it with IsMyLcdOK. 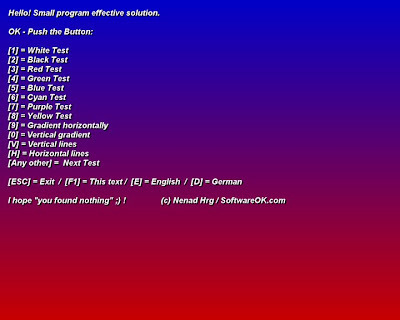 It is free software tool that perform various test to determine dead pixels. Just launch the application to run in full screen. On its main interface, you'll be asked for different test options. 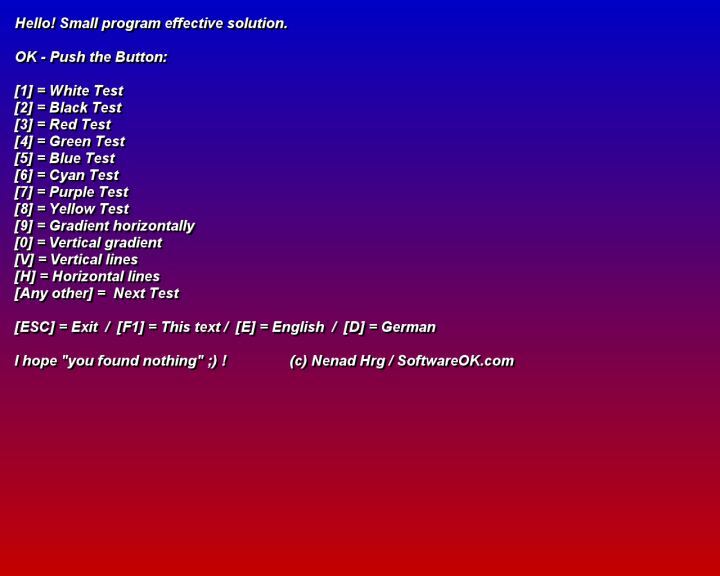 To perform any test, just hit the respective test number on your keyboard. For example, you can go for White Test to check for dead pixel. Press 1 to cover whole screen with bright white color to find a dark dead pixel. Similarly, you can check lit up pixel by performing the Black Test. You can do all the test by pressing F5 to perform the endurance test. Many times compression tools such Winzip and jZip fails to compress document files including MS Docs and PDF files. A specialized tool for such situation is needed and PocoDoc is one of them. 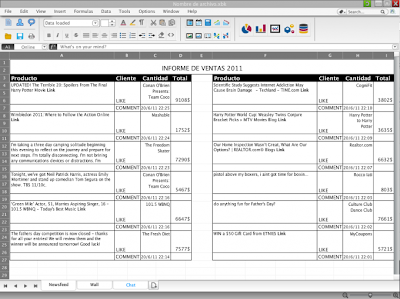 PocoDoc is a free online tool that can compress document file size according to specified compression level. It supports 19 compression levels, 1 being the highest and 19 for the lowest. Take note that higher compression level may distort your document's content so choose the level wisely. Its usage is simple, enter your email address where the optimized file will be sent, choose the document to compress, select the optimization level and finally hit the Optimize button. Are you still using different tools for merging, encrypting, adding watermark and converting PDF files? If you answer Yes, then you should try PDFill PDF Tools, a dedicated tools that can perform all these PDF operations and more. 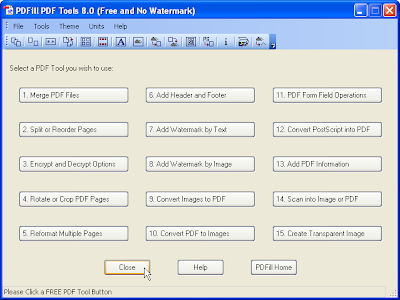 It is simple to use, from the main interface, select the PDF Tool button you wish to use. 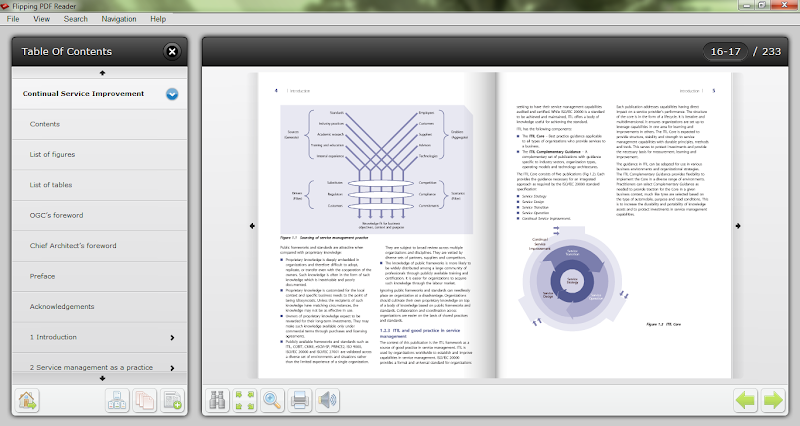 For an instance, if you want to add watermark to your PDF, click "7. Add Watermark by Text" or "8. Add Watermark by Image". In this blog, I have already mentioned several recovery tools that fix corrupted documents, zip or archived files and Outlook files. Using different recovery tools for different file formats is less efficient compare to using one tool for all. Fortunately File Repair software can do just that, repair corrupted files of various formats. 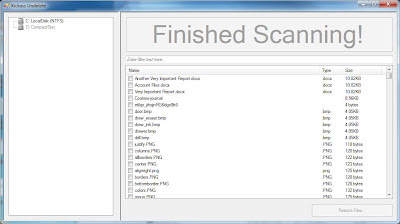 It scans the damaged file and extracts maximum data from it to a new usable file. 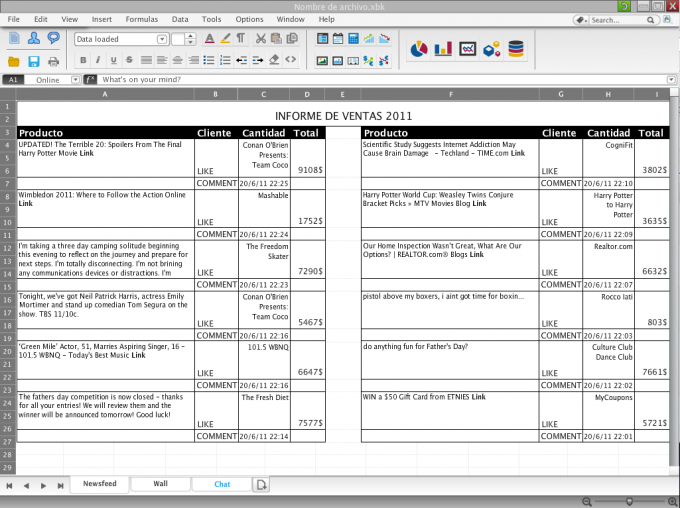 It supports documents such as Word and Excel, zip file, images and media files. Its usage is simple, select the source file to be repaired and click Start Repair. When troubleshooting PC for problems, you'll need all the information you can get. Although Windows has its own system information tool, this is not as comprehensive and organize as SimpleSysInfo can offer. SimpleSysInfo is a portable tool that can retrieve most of the information from your computer. Its usage is simple. Once you download the app, you can launch it right away. 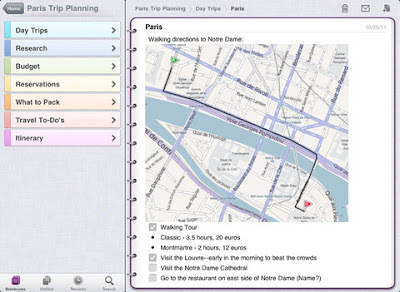 It will automatically gather information from your computer and will display an interface grouped in tabs. Like any other activities, when you practice using Digital Single-Lens Reflex (DSLR) camera, you skills will get better. The choice between a point-and-shoot and SLR camera comes down to how much control you want to have over your camera settings. Professional and wannabes choose SLR to take better control over the lighting, ISO, aperture, shutter, and distance to get the best and personalize settings for their shoot. Changing these settings will affect the camera exposure which will lead to the final product. Experimenting with exposure is not easy, you may end up taking hundreds of photos until you achieve your desired output. To help you understand and experiment without an actual camera is a simulation tool called CameraSim. It is an online simulator where you can learn about ISO, aperture and shutter speed settings, and shooting under various lighting conditions without using an actual SLR. Notifications for friend request and accepted friend request are available in Facebook. If you have large list of friends, one thing you won't know is if someone from your list removed you from their friend list. You may notice that the friend counter is declining but you wont able to determine who's missing until you check your friend list thoroughly. 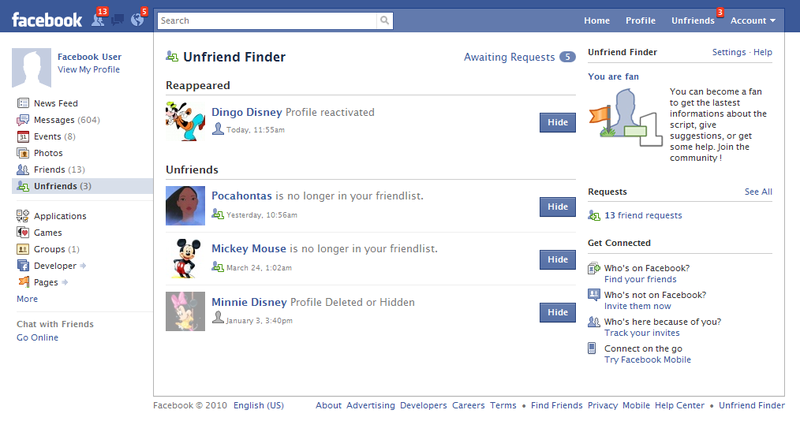 If you wish to know which one of your friends removed you from their list then user script Unfriend Finder is for you. Unfriend Finder keeps record of your friend list and compares its local database to Facebook each refresh. It displays a red counter in the menubar with the amount of unfriends you have. It also uses Facebook notification to alert you on these events. 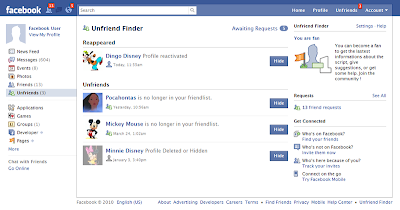 Unfriend Finder is compatible with Mozilla Firefox, Google Chrome, Opera and Safari. Unusual problems in Windows is not so unusual anymore. Problems may start from building when you start installing applications that alter Windows registry and services. Although Restore point can reverse back these changes in your machine, some users don't or forget to use it. 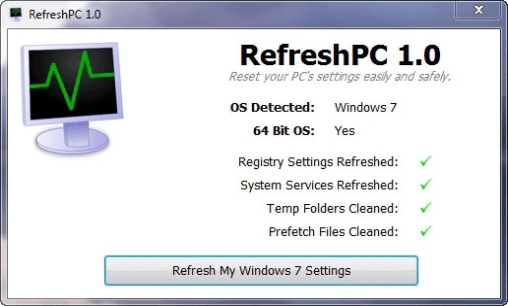 The next best option are free tools that can restore your Windows to its original state and Refresh PC is one of them. RefreshPC is a free application that allows you to reset your PC to its original registry settings and set all Windows services to their default state. This can fix most of configuration errors caused by newly installed application and even malwares. 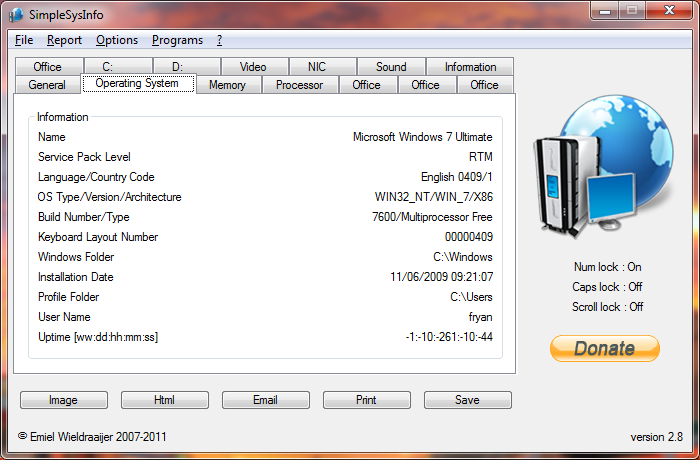 All that is required is to launch the application and click "Refresh My Windows 7 Settings" button. Most people read news early in the morning before they start their day at work. If your into news, then probably you may want to make them as your wallpaper. With the website News Wallpapers, you can do such by downloading any one of the available themes from various news site. 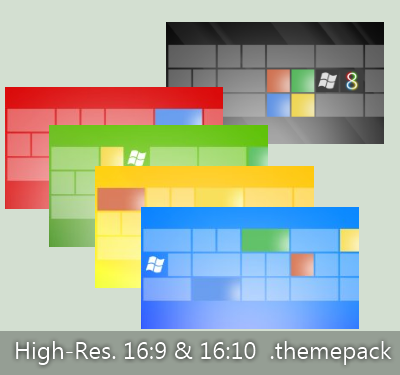 Just select from the list of available themes to download it. Once downloaded, click the theme file to install and that's it, you'll have news wallpapers. To know more, watch this demo video. These are RSS themes meaning your news wallpaper will change automatically with the latest headlines at predefined intervals. The conventional way to accept calls is to hit the green phone icon on your mobile and red icon to end calls. This is pretty acceptable but more difficult when doing something else like driving. If you want a different and easier way to accept and end calls then try shaking it with ShakeCall android apps. 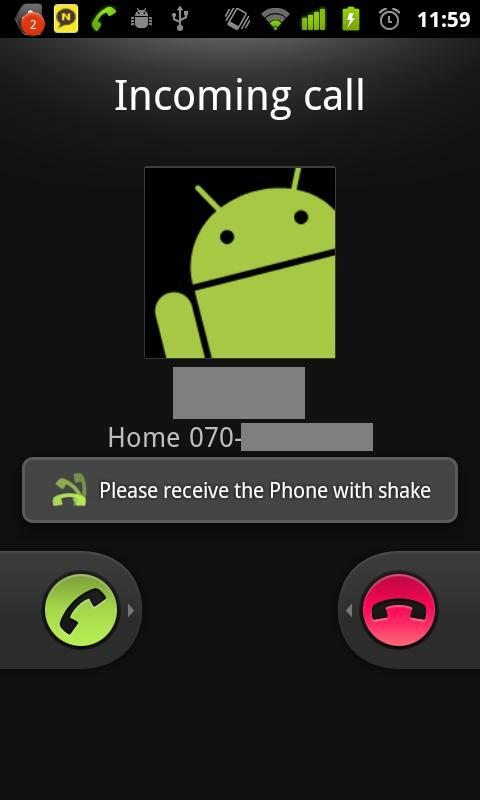 With ShakeCall, you can easily take any call just by shaking your phone. Once installed, the app monitors for incoming and outgoing calls and uses the proximity sensor to detect shake movement to invoke call acceptance and ending.